The founder of Toc H, Tubby Clayton was born in Maryborough, Queensland in 1885. He was baptised in St Paul’s Anglican Church in Maryborough and inside the church is a plaque in memory of Tubby. In the parish hall is a stained glass panel of a Toc H Lamp which has only recently been installed. 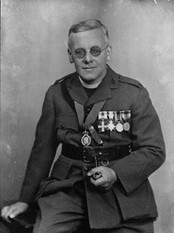 There was a very strong Branch of Toc H in Maryborough from 1932 – 1941 and from 1947 – 1953 and it was in the 1930’s that members of the Branch were encouraged by the Governor of Queensland, Sir Leslie Wilson, to set up a project for children from outback Queensland who were in need of medical treatment. This was the beginning of the Royal Queensland Bush Children’s Health Scheme. At about the same time Toc H members in Townsville set up a similar program for children from North Western Queensland. This photo was taken in 1935 at the Bush Children’s Health Scheme in Pialba. 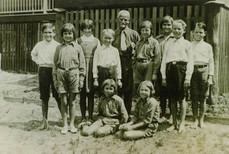 The children pictured are from Western Queensland and with them is Toc H member Bill Feuerherdt who always ensured that the children could swim before they returned home. This was a real feat for bush children in those times. In the 1930s hundreds of children benefited from the camps run by Toc H members in Maryborough and Townsville and medical treatment was provided by doctors free of charge. There is a plaque in the footpath on the Heritage Trail in memory of Tubby Clayton and in the gardens in Maryborough is a life size bronze statue of his dog, ‘Chippy Mark IV’. The Changi Rushlight which was made and used in Changi Prisoner of War Camp in Singapore in World War II. There were sixteen Toc H Branches/Groups in Changi. One of the altars in the south transept of the Cathedral is a Carpenter’s Bench, which is modelled on the Carpenter’s Bench in the Upper room of Talbot House in Poperinge in Belgium. It is beautifully crafted and was given to Toc H Newcastle by a Mr and Mrs Lane in memory of their son, Arthur Edward Lane, who was killed by a shark at Merewether Beach in 1928. Under the Carpenter’s Bench is a life size sculpture of “Chippy Mark IV” which was the last of a long line of Cairn Terriers that were given to Tubby, first of all by Queen Mary and later by Queen Elizabeth, the Queen Mother. 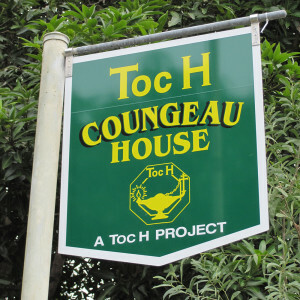 Coungeau House was acquired by Toc H in 1968. 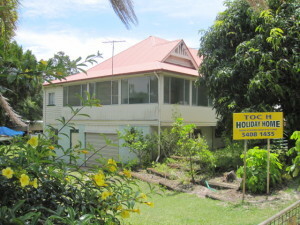 The house is one of the most historic buildings on Bribie Island. It was built in 1915 by an Albanian Wine and Spirit Merchant who owned a liquor business in Petrie Bight near the Old Customs House in Brisbane. Mr. Coungeau and his wife lived in the house for a number of years. Mrs. Coungeau was an accomplished poet and many of her poems were published. Unfortunately she became ill and was hospitalised and the house was put on the market to be sold. However, the offers were so low that Mr Coungeau decided to donate it to the Church of England. 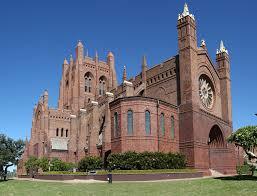 It became a holiday home for the clergy. Today Coungeau House is a Holiday Home for the disabled and those in need. It is used by many Community Welfare Groups on Bribie Island for meetings and other functions. A well-known personality who lived on Bribie for many years was Ian Fairweather. He was renowned also as an authority on China and his book, “The Drunken Buddha”, was highly regarded as a comment on China’s social history. He was also an artist of some note. When he died he left his cottage to Toc H and in April, 1978 it was moved into the grounds of Coungeau House and became the caretaker’s cottage. The Toc H Midnight Service on ANZAC Eve has an interesting history. In 1947 a small group of veterans from World Wars I and II, and their wives, gathered inside the Shrine of Remembrance in Ann Street, Brisbane at midnight on ANZAC Eve and held a short service to remember and to honour their friends who had fallen in these wars. All were members of Toc H. Some were survivors of the Battles of Polygon Wood, Menin Road and Passchendaele; others had recently seen service in the Middle East and on the Kokoda Trail. Toc H had brought them together for this service and the strong bond of ‘mateship’ that developed amongst them inspired them to serve in another way, and to do all they could to build a better world and help people wherever they could to lead worthwhile and fulfilling lives. They saw service as: ‘THE RENT FOR THEIR ROOM ON EARTH’. From small beginnings in 1947 the Midnight Service on ANZAC Eve has developed into one of the major projects of Toc H in the Northern Region. 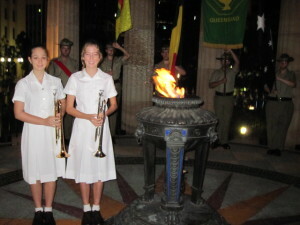 In 2011 it was supported by several hundred people with a seventy voice choir from the University of Queensland, the Queensland University Musical Society Choir; Australian Army Cadets, who formed the Catafalque Party and carried the flags of Australia, Belgium and Poperinge; and students from St Margaret’s Anglican Girls School, who placed the wreaths at the foot of the Eternal flame and who played The Last Post and Reveille.